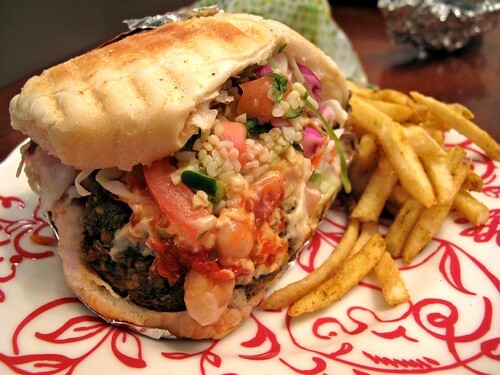 Falafel that comes in a pita that’s kind of like a hamburger bun. Stuffed with lots of toppings and relish. Order a side of curry fries. Very cute artistic cafe style atmosphere in a neighborhood that is great for strolling around. Tiny storefront, but take your food to one of the many bars in the neighborhood. Also now at Flagship Commons! I really love all the toppings – the relish, the couscous, the salad. I love pickles on falafel (it’s a NY thing) and the relish satisfies my cravings. The falafel is seasoned perfectly and always amazing. They don’t have tahini which is a bit odd, but with all the toppings you don’t really miss it. Just make sure to get hummus or things can get a bit dry. The hot sauce is vegan, the yogurt sauce is obviously not. Make sure you ask which sauces are vegan! The only vegan sauce they have is the spicy one. Just a heads up! When I have friends visiting from out of town, this is one of the top 5 spots I make sure we hit up! Servings are HUGE so we usually split the meal. Half a sandwich is ample, I assure you. The spicy sauce is the only vegan one and it is SPICY, so skip the sauce altogether if you don’t have the stomach for it. Also be sure to try the curry fries! Skip the mayo and ask for an extra side of sauce. Check out eCreamery next door afterwards, they usually have a vegan option if you ask.